The leaders of the United States and China offered starkly contrasting views of the direction for trade in Asia in separate speeches Friday to regional business leaders. U.S. President Donald Trump told the APEC CEO Summit that he is willing to make bilateral trade agreements with any country in the Indo-Pacific region, but he firmly rejected multinational deals such as the 12 nation Trans Pacific Partnership, which was quickly abandoned in the first days of his administration. China has already shown that it has no intention of playing by the rules, said Fraser Howie, co-author of the book "Red Capitalism: The Fragile Financial Foundation of China's Extraordinary Rise." China has shown that it has no intention of playing by the rules, said Fraser Howie, co-author of the book Red Capitalism: The Fragile Financial Foundation of China’s Extraordinary Rise. Howie added that trade and access issues are difficult and sophisticated, and so far Trump has a poor track record when it comes to follow through, be it his travel ban, the border wall between the U.S. and Mexico, health care or tax policy. China's President Xi Jinping arrives for the APEC Summit in Danang, Vietnam, Nov. 10, 2017. 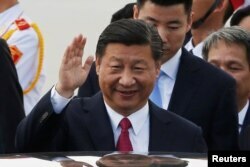 Chinese President Xi Jinping, whose country’s rise has been driven greatly by large-scale government planning, immediately followed Trump on the stage in Danang. China was left out of the TPP, which was led by the United States and Japan, and was meant in great part as a bulwark against China’s strategic ambitions. The speeches came just hours after Trump left China where he and Xi met several times Wednesday and Thursday. U.S. President Donald Trump and China's President Xi Jinping attend a state dinner at the Great Hall of the People in Beijing, Nov. 9, 2017. 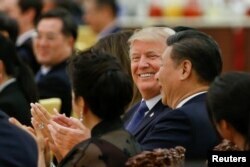 In Beijing Thursday, the U.S. president had struck a markedly softer tone than in the past on touchy subjects such as North Korea and trade saying he had an “incredibly warm” feeling for Xi. The Chinese leader said Beijing’s relationship with Washington “now stands at a new starting point” and vowed to “enhance communication and cooperation on the nuclear issues on the Korean Peninsula” and other issues. “For China and the United States, cooperation is the only viable choice, and win-win cooperation can take us to a better future,” said the Chinese president. Much of Trump’s Asia tour has focused on North Korea, which is developing a nuclear and missile program in violation of U.N. Security Council resolutions. Speaking in Beijing, Tillerson said “there is no disagreement on North Korea” between the United States and China. The diplomat pointed out that the Chinese have been clear and unequivocal over two days of talks that they will not accept a North Korea with nuclear weapons. Beijing correspondent Bill Ide contributed to this report.